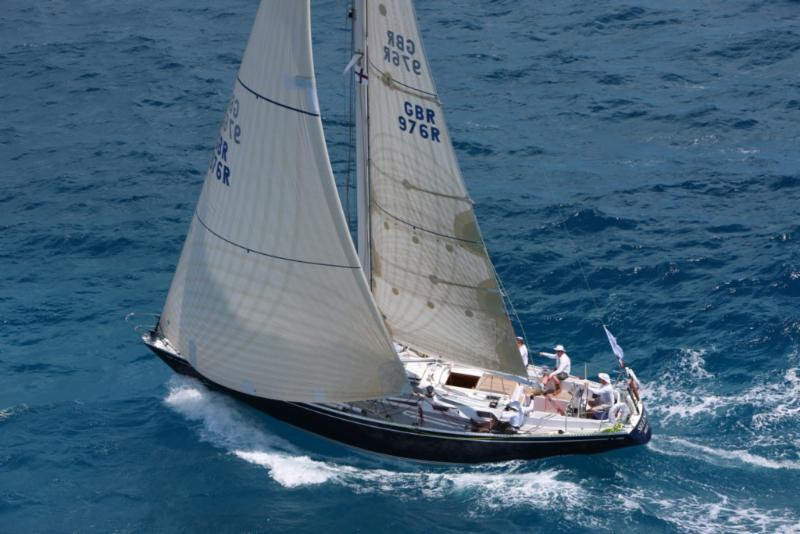 At 0700 local time, on Day Two of the RORC Caribbean 600, George David's RP90, Rambler, had opened up a four mile lead on the water from Hap Fauth's JV72, Bella Mente. Rambler's water-line length is a big advantage on the longest reaching leg of the course and the American Maxi is expected to extend that advantage during the day, on the water at least. Overnight, Bella Mente had stretched six miles ahead of George Sakellaris' RP72, Shockwave, to lead IRC Zero on corrected time by 15 minutes. Johnny Vincent's Pace was in a solid third place in class and will be hoping that the lead boats will run out of breeze at some stage of the race so that the British TP52 can press home their rating advantage. During the first night, squalls were ripping through the race course at regular intervals, bringing cold rain and erratic wind; both in speed and direction, testing the mettle of the 60 strong fleet. One of the smallest yachts in the race, Hot Stuff, crewed by Girls 4 Sail, was approaching St.Kitts. The rest of the fleet, bar Rambler, Bella Mente and Shockwave, were negotiating the chicane at the top of the course, weaving through the stunning islands that make the RORC Caribbean 600 one of the most beautiful offshore races in the world. The twin masted schooners, Adela and Athos, have covered over 230 miles in just 20 hours. Athos is just a mile ahead of Adela on the water but, after time correction, Adela leads the Superyacht Class. The two largest yachts in the race are about to enter the narrow confines of the Anguilla Channel and a tacking duel of epic proportions is the likely outcome. In IRC One, Piet Vroon's Ker 46, Tonnerre de Breskens 3, has covered over 200 miles of the course in just 20 hours and continues to lead the class, both on the water and on corrected time. Behind Tonnerreare two displacement Swans: Colin Buffin's Uxorious IV, and Todd Stuart's White Rhino. Taking into account time correction, the beat through the Anguilla Channel and the reach down to Guadeloupe may favour the two heavyweight competitors, especially as the current wind speed is sub 15 knots which is too little for the light displacement Tonnerre to use her planing ability. 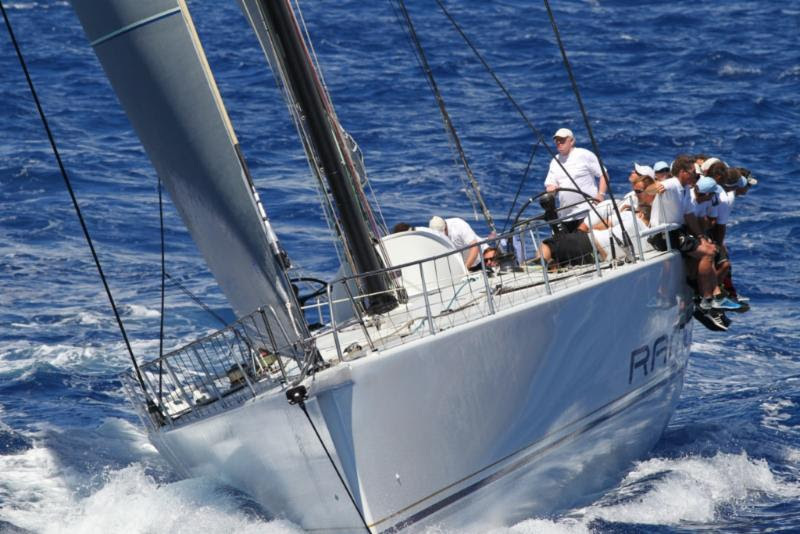 In IRC Two, all 12 yachts have averaged close to eight knots since the start, providing a highly competitive fleet. Peter Sowrey's First 40, Lancelot II, has been punching above her weight, no doubt aided by the talents of solo round the world sailor, Alex Thomson. On the water, Global Yacht Racing's First 47.7, EH01, and Bernie Evan Wong's Grand Soleil 43, Quokka 8, are having an intense battle for line honours in the class, with Lt Col Paul Macro's Royal Armoured Corps team on Southern Child, just a mile behind the on-the-water leaders. In IRC Three, Classic S&S 52, Dorade, has stretched out a five mile lead on the water and leads the class after time correction. Adrian Lower's Swan 44, Selene, has taken an absolutely flier. After rounding Saba,Selene tacked and bore away to take up an extreme offshore position, looking to lay St.Barths in one tack: Banging the Corner. Presumably, Selene feel that this tactic will pay off but it is quite a gamble.